Seating Arrangement & Puzzle Questions For IBPS Clerk. HSeating Arrangement & Puzzle Questions For IBPS Clerk/Canara Bank PO 2018.Welcome to the www.letsstudytogether.co online Reasoning section. If you are preparing for IBPS Clerk 2018 you will come across a section on Reasoning Ability Section. Here we are providing you with Reasoning quiz on “Seating Arrangement & Puzzle Questions For IBPS Clerk” for your daily practice. 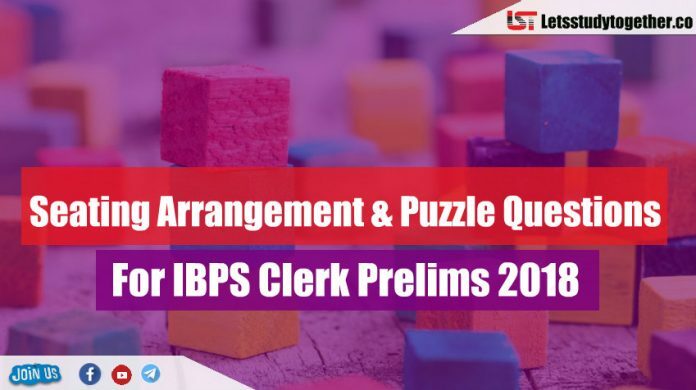 This “Seating Arrangement & Puzzle Questions For IBPS Clerk” is also important for other banking exams such as SBI PO, IBPS Clerk, SBI Clerk, IBPS RRB Officer, IBPS RRB Office Assistant, IBPS SO, SBI SO and other competitive exams. Directions: (1-5) Answer the questions based on the information given below. There are seven persons namely, Annu, Basu, Charu, Dev, Emran, Fiza and Garv, who are sitting in the row facing north and there are nine seats in the row. Dev is the immediate neighbor of Basu. Dev sits to the right of Annu and only one person is seating between Dev and Annu. Only one person is sitting between Basu and Garv. Fiza is sitting on the seat, which is adjacent to the seat of Annu. There are two seats between Dev and Annu, and also between Dev and Emran. Charu is sitting to the immediate right of Garv. The seats which are at the ends of the row are not vacant. One of the seats adjacent to the seats of each of Dev and Emran is vacant. Who is sitting at the right end of the row? Who is sitting to the immediate right of Emran? Who is sitting at left end of the row? How many persons are sitting to the right of Basu? How many persons are sitting to the left of Fiza? Directions:(1-5) Read the following information carefully and answer the questions. There are eight students A, B, C, D, E, F, G and H who have obtained marks in theory 66, 68, 70, 72, 73, 75, 77, 79 (out of 80) but not necessary in the same order and marks in lab 11, 12, 13, 14, 15, 16, 18, 19(out of 20) not necessary in the same order. E’s lab marks are 15, which is half of the sum of lab marks of A and B. C’s and F’s lab marks are prime numbers. C gets maximum marks in theory. Difference of theory marks of B and G is same as that of E and F. H has a total of 77 marks including both Theory and Lab. The theory marks of A are four times of his lab marks. Lab marks obtained by G is less than that of D. E has second highest marks in theory. The theory marks of B are seven more than that of G. The difference between the lab marks of F and G is more than three. What is the sum of marks of F in Theory and Lab? If D is related to ‘72’ and F is related to ‘68’, in the same way B is related to which of the following? Who gets the maximum marks including both Theory and Lab marks? Who has got the highest marks in lab? What is the sum of theory marks of A, B and D?